What’s Going on inside the Heart of Cardiac Services? 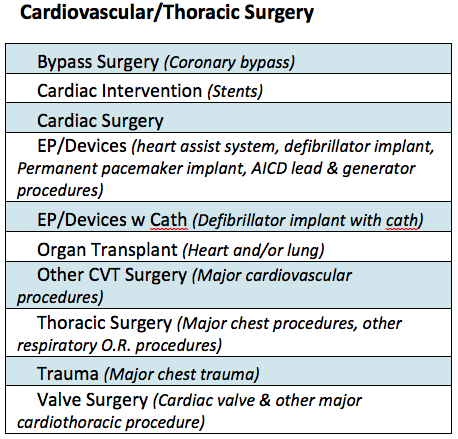 The first step was to define sub-categories for Cardiology and Cardiovascular/Thoracic Surgery (CVT surgery) service lines for a clearer picture of where declines are occurring. Total Medicare Cardiac Services inpatient cases declined, -8.6% from 2009 to 2011. Cardiology inpatient cases declined, -7.6% from 2009 to 2011. Cardiovascular/Thoracic Surgery inpatient cases also declined but at a much larger rate, -11.2% from 2009 to 2011. Looking inside Cardiology, we can see that the largest decline in Electrophysiology (EP)/Devices (pacemaker replacements and revisions). This decline was followed by Cardiac Catheterizations, Other Cardiology and Acute Myocardial Infarctions (Acute MI). Acute MIs declined the least, -6.5% from 2009-2011. Although Cardiovascular/Thoracic Surgery declined more than Cardiology, some subservice lines actually increased in volume. Heart and lung transplant MS-DRGs increased 32% from 2009 to 2011. Valve surgeries increased 3.9% from 2009 to 2011. Major chest trauma increased 6.4% from 2009-2011. The largest declines in the CVT Surgery service line were Cardiac defibrillator implants with cardiac catheterization, declining 23% from 2009 to 2011. This decline was followed by EP/Devices declining 18%. Cardiac bypass surgery is down 13% and Cardiac interventions are also down 13%. Looking even further inside the Transplants sub-service line (MS-DRGs 001, 002, and 007). MS-DRG 001, Heart transplant or implant of heart assist system with major complications or comorbidities increased 51.7% from 2009 to 2011. The proliferation of heart assist systems has propelled this tremendous growth, not necessarily heart transplants. In California and Florida we analyzed the same time period, 2009 to 2011 for trends. In California, the Cardiology trends are the same as for Medicare, declining 5.8%. The highest decline was in EP/Devices (-17%), and the lowest decline in Acute MI (-1.5%). In CVT Surgery, again the same trends, total volume down 6.2% with increases in transplants (21.9%), trauma (11.6%) and valve surgery (9.5%) while EP/Devices with Cath (-13.2%) and EP/Devices (-11.8%) declined the most. In Florida, Cardiology declined 5.4% while CVT surgery declined 8.5%. 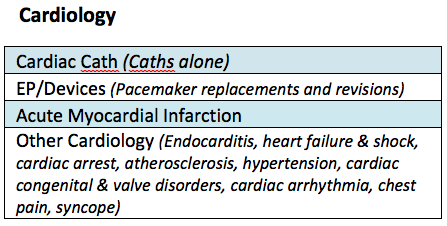 In Cardiology, Cardiac Caths (-8.2%) edged out EP/Devices (-7.2%) for the highest declines in Cardiology. Other Cardiology (-4.2%) declined less than Acute M.I (-6.2%). In CVT Surgery, the same trends appeared, transplants (21.6%), trauma (13.5%) and valve surgery (13.5%) increased while the EP/Devices with Cath (-23%) led the decliners followed by EP/Devices (-14.8%). In Texas, we analyzed 2010 and 2011 data. All of the Cardiology sub service lines declined for a total 2.7% decline, and EP/Devices (-9.3%) led the way. CVT surgery declined 3.5%, but the trends within CVT surgery shifted slightly, transplants were down (-17.8%), but Other CVT surgeries increased 4% from 2010 to 2011, trauma (8.6%) and valve surgery (4.1%) also increased. The decliners were led by EP/Devices with Cath (-27.1%) and EP/Devices (-10.2%). If you would like a cardiac services analysis for your market, contact us at sales@stratasan.com. Sources: Center for Medicare & Medicaid Services, Medicare Provider Analysis and Review (MedPar) hospital discharge data, 2009-2011. State of California Office of Statewide Health Planning and Growth, 2009-2011 hospital inpatient discharge data. State of Florida Agency for Health Care Administration 2009-2011 hospital inpatient discharge data. Texas Department of State Health Services, Texas Health Care Information Collection 2010-2011 hospital inpatient discharge data.